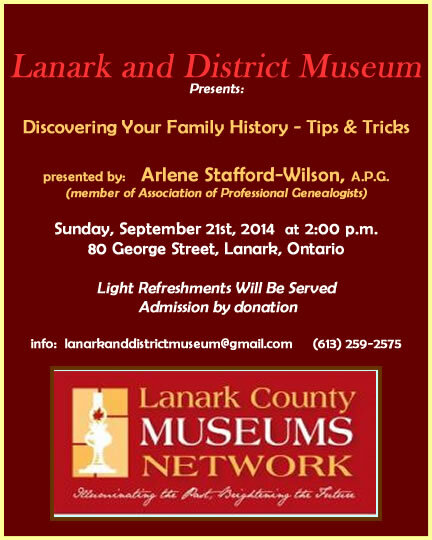 Join us on Sunday, September 21st at 2:00 p.m. for some Tips and Tricks on researching your Family History! What are some common mistakes to avoid? What is the best way to find that elusive ancestor? Find out the easiest way to organize your genealogy. Learn about some of the best records to aid in your search. What are some common errors found in family bibles? How to verify a family legend or family lore. Tips on interviewing older relatives. Why is it important to research collateral lines in a family? How can we use historic maps to support our research? Tips on the best ways to use census records. How do we find our ancestor on a passenger list? ……and much, much, more! This entry was posted in Author Events & Book Signings and tagged Archives Lanark, Arlene Stafford-Wilson, Lanark County family history, Lanark County Genealogical Society, Lanark County genealogists, Lanark County genealogy, Lanark County Museums Association, Lanark County professional genealogists, Lanark Museum, Perth Ontario. I have a couple of cousins who’ve done some genealogy work on the Arthur side of my family, I might find your talk interesting. I’m from Perth. Hello Susan – We are related to the Arthur family through marriage – ‘Jim’ Ronald James Arthur, son of William James Arthur and Muriel Cornell – Jim married my first cousin. It’s a small world – particularly as there were so many families that settled in Lanark County, and some remained for generations. It’s interesting the way the families weave in and out, and branch out and connect with so many other families in the area. I’ve got lots of material to cover next Sunday and look forward to meeting lots of people interested in finding out more about their roots.